Once upon a time, there was a wild, wild West—a fantastic place full of heroic cowboys, dastardly Indians, damsels in distress, and guns galore. For about a century, 1870s–1970s, this mythical West held a powerful grip on the American imagination and dominated media. Then the myth came tumbling down. Starting with “McCabe and Mrs. Miller,” Hollywood started portraying a dreary West of non-heroic heroes and muddy morality. Scholars like Donald Worster (Rivers of Empire) examined a West built more on mineral extraction and water rights than ranching, and William Truettner (The West as America) demonstrated the differences between the idealized West in art vs. the actual West. In the new century, the re-examination of the mythic West continues with the stereotype-challenging movie, Brokeback Mountain, the noire television series, “Deadwood,” and now the stories of Shann Ray, collected in American Masculine. Mr. Ray’s stories show us a contemporary West of ordinary people. They have plenty of cowboys and Indians, but there’s nothing glamorous about them. Few of Mr. Ray’s stories are upbeat and some end tragically (i.e., a train full of passengers turns into an ugly mob and murders a Native American passenger). Even Mr. Ray’s stories with happy endings aren’t all that happy. In two of his stories, married couples stay together following long estrangements, but the author seems to suggest that the reconciling couples will achieve equilibrium, rather than achieving happiness. Mr. Ray alternately covers enormous swaths of time or painstakingly dissects a single event. The upside of his fast forward narrative in stories like “The Great Divide” is that he successfully condenses a life into a short story. The downside is that the reader is jolted across decades and settings—and can become disoriented. More consistently satisfying are Mr. Ray’s intense studies of a single event. In “The Way Home,” for example, he beautifully narrates the conflict within an alcoholic father driving past his favorite bar. 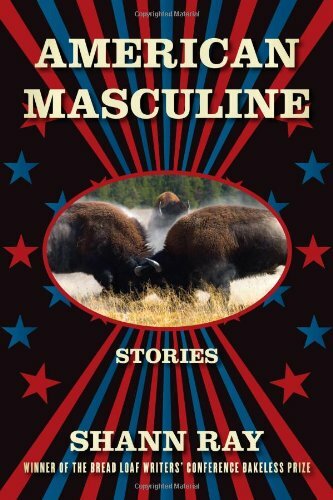 American Masculine joins a small cadre of contemporary rural-gothic short story collections. As with the best of these, such as Alan Heathcock’s Volt: Stories [reviewed in NY Journal of Books], Shann Ray’s stories are reminiscent of Realist-school masters like John Steinbeck. But the Realists generally found a more optimistic balance of light and dark than Ray exhibits in American Masculine. American Masculine is a well-conceived and intricate painting. It can be admired for its craftsmanship and for the authenticity of the artist’s vision, but it doesn’t brighten up the room.